Hanoi (VNA) – Prime Minister Nguyen Xuan Phuc offered incense to late President Ho Chi Minh at the Da Chong (K9) historical relic site in Hanoi’s outlying district of Ba Vi on August 20, on the occasion of the 72nd anniversary of August Revolution and National Day (September 2) and the 48th death anniversary of the late leader (September 2). K9 was a venue where President Ho Chi Minh, Politburo and Party Central Committee members decided the country’s crucial issues during the anti-American war. It was also chosen to preserve the body of the late President from 1969-1975. He took the occasion to urge the municipal People’s Committee to consider the board’s proposal to upgrade transport infrastructure leading to the K9 relic site. 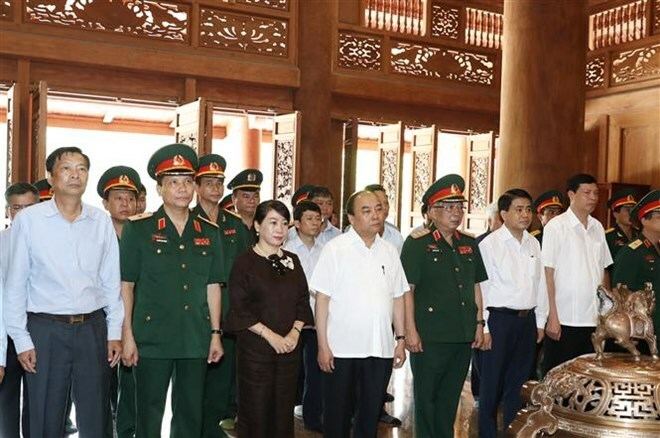 Major General Nguyen Van Cuong, head of the board and Commander of the President Ho Chi Minh Mausoleum Guard High Command, reported that the mausoleum welcomed nearly 2.2 million visitors in the first half of the year, including 495,000 foreigners. Tourist arrivals to the mausoleum rose10-12 percent annually on average. The board also upgraded President Ho Chi Minh memorial house, launched free wifi and opened electronic kiosks to popularise the life and career of the late leader, among others.